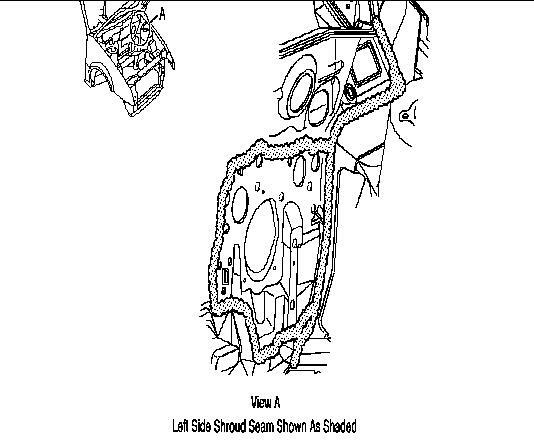 This section covers common water leak areas for the "L" body car. Again it's recommended that you have a factory service manual or other equivalent type of book to help aid in the removal of parts. This section should be used as a guide to help you locate water leaks. The service bulletin number above can be given to a GM tech if you take your car in for service. The information below is taken directly from said bulletin. From personal experience I have had some water leak trouble in my Beretta. I'll offer some tips that I used, it is much easier to locate a leak with the carpet removed. While it takes some time to remove the carpet you thank yourself later. It has taken me several tries to locate the leaks, don't give up they can be frustrating to find! As for a sealer to use I would recommend a silicon type sealer. I used GE brand silicon II, one thing that I like the fact that it is permanently flexible and is UV resistant. Other brands didn't make that claim so I went with it. They (GE) sell a "automotive" blend that comes in black. I looked closer and their "premium" outdoor Silicon II contained the same ingredients but was clear instead of black. I first started out with the small auto tube but needed a LOT more and found the clear caulk gun tube was a better buy. Also many of the spots that need to be re-sealed are hard to access and get the tube into. I used latex doctor gloves and put some caulk on my finger and spread it on the spots I suspected of leaking. Follow the instructions on whatever type of caulk you buy and make sure your surfaces are clean and dry. I used a heat gun to make sure everything was really dry but a hair dryer would probably work. On last tip if you need to remove your air inlet screens at the base of the windshield I would recommend that you buy a battery terminal puller. It works great for removing your wiper blade arms. Condition: Carpet wet under right side of instrument panel. 1. Sealer skip/void or spot weld burn through at plenum seam. Refer to figures 1 and 2. 1. Remove Air inlet screen. Refer to section 10-5 of the service manual. 2. Inspect for a skip or void in the plenum seam sealer or for spot weld burn through. 3. Apply clear sealer to any skip or void in the plenum seam sealer or to any spot weld burn through. 4. Allow sealer to dry. 5. Direct water over the plenum seam. 6. 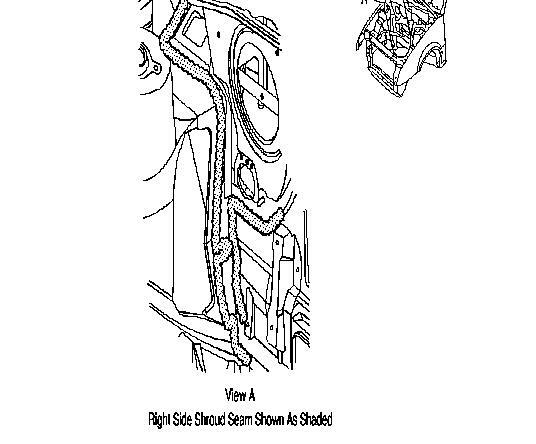 Inspect from passenger compartment for leaks. 7. Install air inlet screen. Refer to section 10-5 of the service manual. 2. Sealer skip/void or spot weld burn through at the right front body hinge pillar seam. Refer to figure 3. 1. Inspect for a skip or void in the right front body hinge pillar seam sealer or for spot weld burn through. 2. Apply clear sealer to any skip or void in the right front body hinge pillar seam sealer or to any spot weld burn through. 3. Allow sealer to dry. 4. Direct water over the right front body hinge pillar seam. 5. 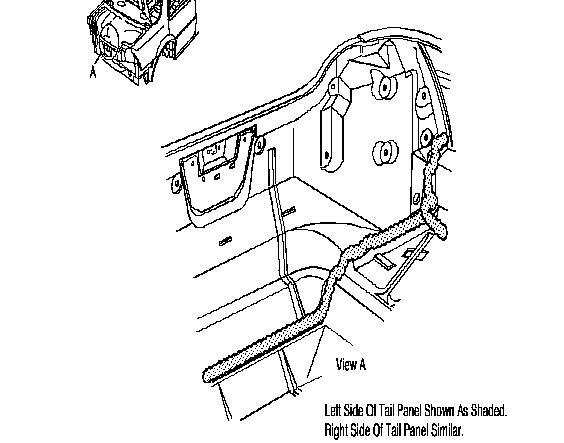 Inspect from passenger compartment for leaks. 3. Sealer skip/void or spot weld burn through at the right side shroud seam. Refer to figure 4. 1. Inspect for a skip or void in the right side shroud seam sealer or for spot weld burn through. 2. Apply clear sealer to any skip or void in the right side shroud seam sealer or to any spot weld burn through. 4. Direct water over the right side shroud seam. 4. Distortion or void in the ECM connector gasket. Refer to figure 5. 2. Inspect for lumps in the seam sealer which could distort the ECM connector gasket. Refer to step 6 if there are not any lumps in the seam sealer which could cause the ECM gasket to distort. 3. Remove the ECM connector. 4. Remove seam sealer lumps. 6. Inspect for a void in the ECM connector gasket. 7. Apply clear sealer around entire perimeter of ECM connector. 8. Allow sealer to dry. 9. Direct water around ECM connector. 10. 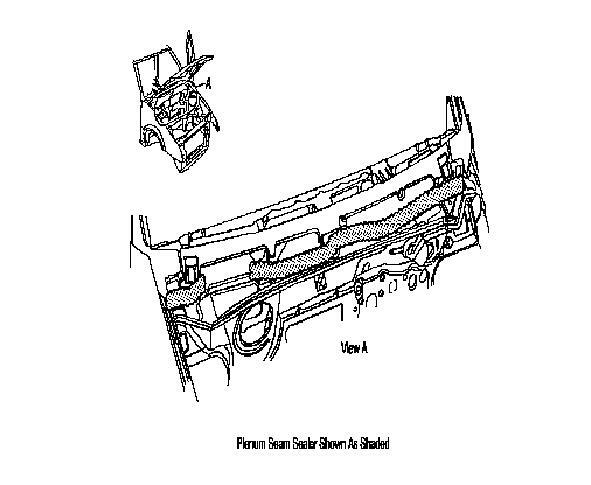 Inspect from passenger compartment for leaks. 11. Install air inlet screen. 5. Distortion or void in HVAC air inlet stack assembly gasket. Refer to figure 6. 2. Inspect for lumps in the seam sealer which could distort the HVAC air inlet stack gasket. Refer to step 6 if there are not any lumps in the seam sealer which could cause the HVAC air inlet stack gasket to distort. 3. Remove HVAC air inlet stack. 5. Install HVAC air inlet stack. 6. Inspect for a void in the HVAC air inlet stack assembly gasket. 7. Apply clear sealer around entire perimeter of HVAC air inlet cover base. 8. Allow air sealer to dry. 9. Direct water around HVAC air inlet assembly gasket. Condition: Carpet wet under left side of instrument panel. 2. Sealer skip/void or spot weld burn through at the left front body hinge pillar seam. Refer to figure 3. 1. Inspect for a skip or void in the left front body hinge pillar seam sealer or for spot weld burn through. 2. Apply clear sealer to any skip or void in the left front body hinge pillar seam sealer or to any spot weld burn through. 4. Direct water over the left front body hinge pillar seam. 3. Sealer skip/void or spot weld burn through at the left side shroud seam. Refer to figure 7. 1. 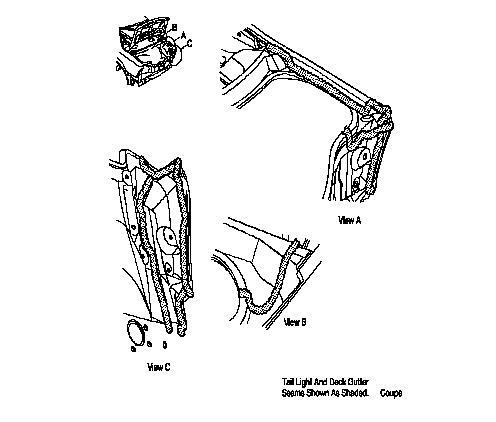 Inspect for a skip or void in the left side shroud seam sealer or for spot weld burn through. 2. Apply clear sealer to any skip or void in the left side shroud seam sealer or to any spot weld burn through. 4. 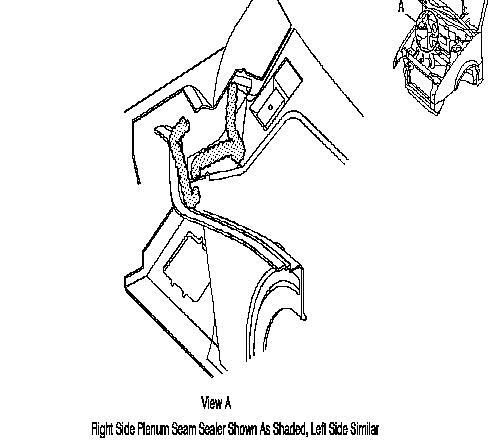 Direct water over the left side shroud seam. 4. 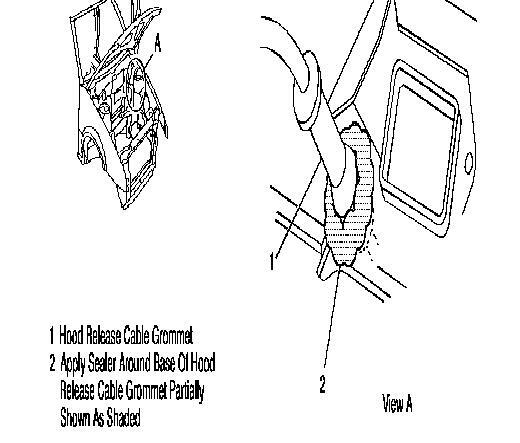 Hood release cable grommet not seated or distorted. Refer to figure 8. 1. 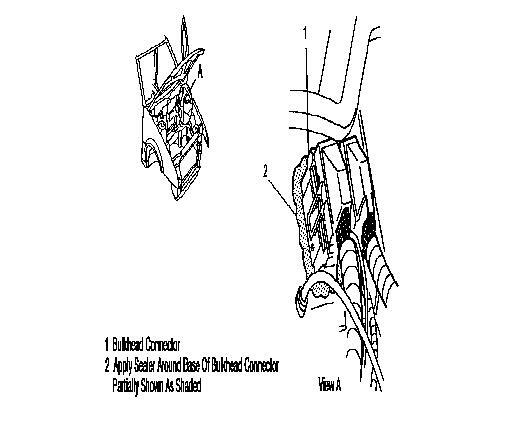 Inspect for lumps in the seam sealer which could distort the hood release cable grommet. 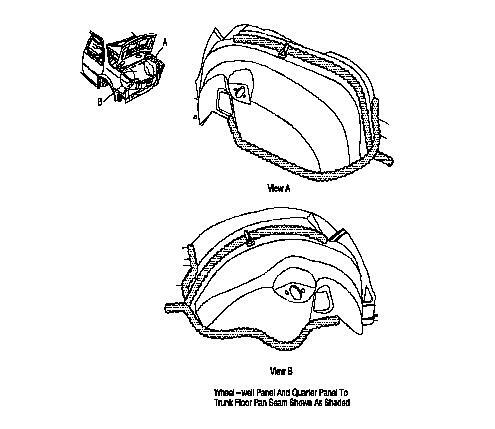 Refer to step 5 if there are not any lumps in the seam sealer which could cause the hood release cable grommet to distort. 2. Remove the hood release cable grommet. 3. Remove seam sealer lumps. 4. Install the hood release cable grommet. 5. Assure the hood release cable grommet is seated. 6. Apply clear sealer around entire perimeter of the hood release cable grommet. 7. Allow sealer to dry. 8. Direct water around the hood release grommet. 9. Inspect from passenger compartment for leaks. 5. Accelerator cable grommet not seated or distorted. Refer to figure 9. 1. Inspect for lumps in the seam sealer which could distort the accelerator cable grommet. 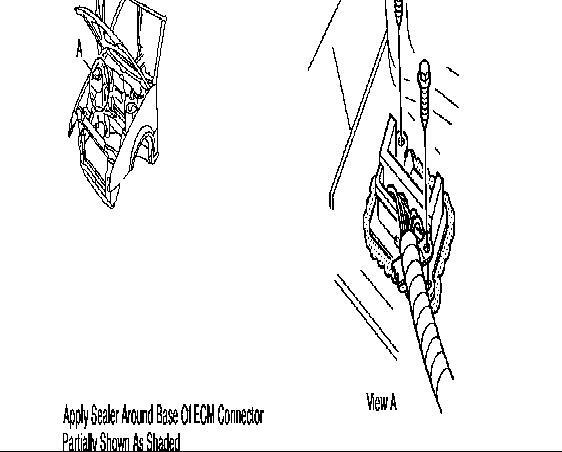 Refer to step 5 if there are not any lumps in the seam sealer which could cause the accelerator cable grommet to distort. 2. Remove the accelerator cable grommet. 4. Install the accelerator cable grommet. 5. 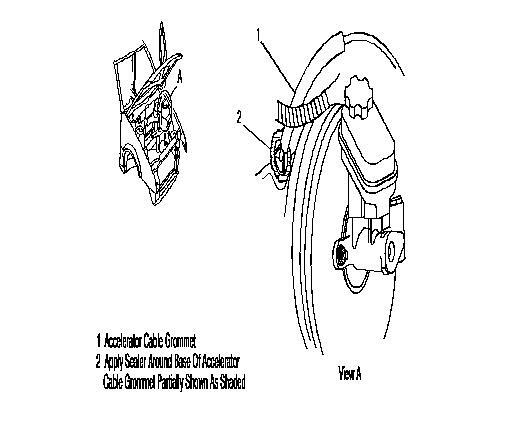 Assure the accelerator cable grommet is seated. 6. Apply clear sealer around entire perimeter of the accelerator cable grommet. 8. Direct water around the accelerator cable grommet. 6. Distortion or void in bulkhead connector gasket. Refer to figure 10. 1. 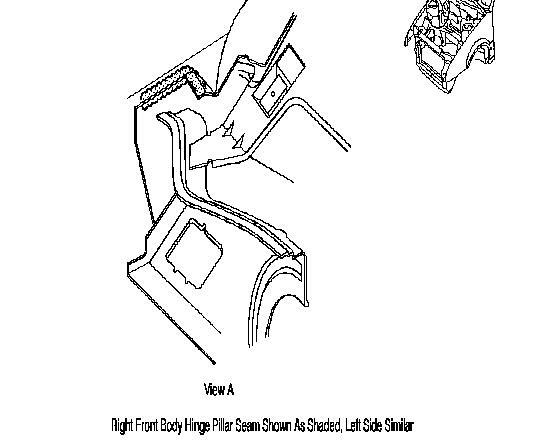 Inspect for lumps in the seam sealer which could distort the bulkhead connector gasket. 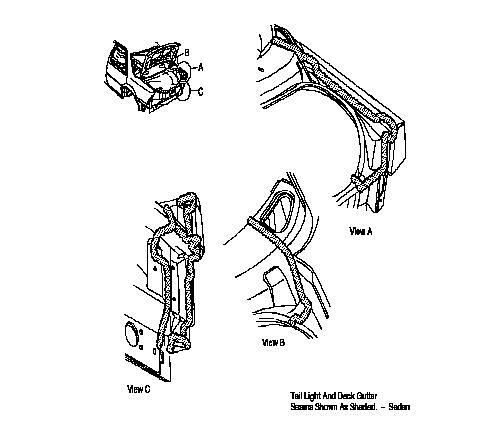 Refer to step 5 if there are not any lumps in the seam sealer which could cause the bulkhead connector gasket to distort. 2. Remove the bulkhead connector. 4. Install the bulkhead connector. 5. Inspect for a void in the bulkhead connector gasket. 6. Apply clear sealer around entire perimeter of bulkhead connector. 8. Direct water around the bulkhead connector. Condition: Carpet Wet Under Doors. 1. Insufficient door weatherstrip compression. 1. Adjust door alignment. Refer to section 10-6 of the service manual. 2. Align door, if needed. Refer to section 10-6 of the service manual. 1. Apply a solution of 50% soap and 50% water around the exterior of the weatherstrip carrier. 2. Apply 40 PSI air pressure around the interior of the weatherstrip carrier. 3. Inspect for soap bubbles. 4. Pull weatherstrip from pinch weld at void. 5. Pinch weatherstrip carrier at void. 6. Apply black weatherstrip adhesive to void between weatherstrip carrier and pinch weld. 4. Void at door water deflector. 1. Adjust door water deflector to seal void. 5. Sealer skip or void at door him flange seam. Refer to figure 11. 1. Inspect for skip or void at door hem flange sealer. 2. Apply clear sealer to skip or void in the door hem flange sealer. 4. Direct water around the door hem flange seam. 1. Urethane skip or void at backglass. 1. Spray a solution of 50% soap and 50% water around the perimeter of the window reveal molding. 3. Inspect for soap bubbles on the outside of the window reveal molding. 4. Remove any interior trim at area of leak. Refer to the appropriate section of the service manual. 5. Apply urethane adhesive to the leak area and 127 mm (5 in.) on both sides of the leak area using a flat bladed tool. 6. Allow urethane to cure. 7. Inspect for leaks. Refer to steps 1 through 3. 8. Remove and install window if leak is not corrected. Refer to section 10-2 of the service manual. 2. Sealer skip or void at roof ditch seam. Refer to figure 12. 1. Remove quarter trim panel. Refer to section 10-7 of the service manual. 2. Pull headliner down enough to apply 40 PSI of air pressure between sheet metal panels from inside of vehicle. 3. Direct water over roof ditch. 4. Bubbles will appear along roof ditch is a leak exists. 5. Remove roof ditch molding. 6. Apply clear sealer to area of leak. 7. 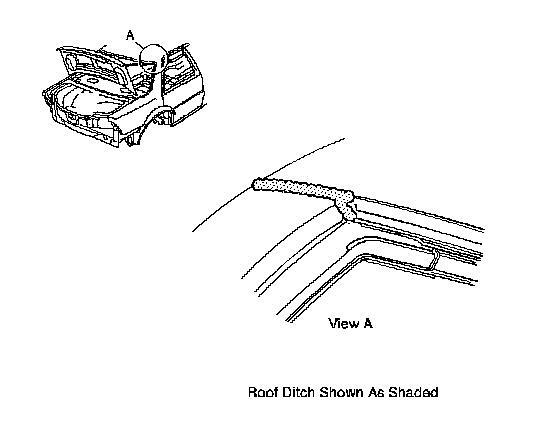 Install roof ditch molding. 8. Install quarter trim panel. Refer to section 10-7 of service manual. Condition: Wet Rear Compartment Area. 1. Sealer skip/void or spot weld burn through at the tail panel seams, deck gutter seams, tail light seams, wheel-well panel seams, or quarter panel to rear compartment floor pan seams. Refer to figures 13 through 16. 1. Remove rear compartment trim. 2. Inspect for a skip or void in seam sealer or for spot weld burn through. 3. Apply clear sealer to a skip or void in the seam sealer or to any spot weld burn through. 5. Direct water over the seam from the exterior of the rear compartment. 6. Inspect from inside rear compartment for leaks. 7. Install rear compartment trim. 2. 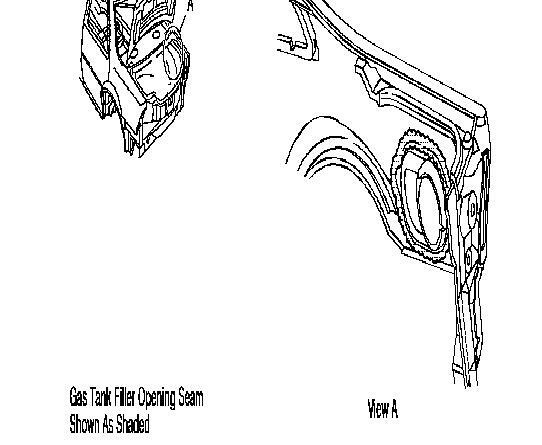 Sealer skip or void at gas tank filler opening seam. Refer to figure 17. 1. Remove right side rear compartment trim. 2. Direct water from under vehicle and around gas fuller opening seam. 3. Inspect inside rear compartment for leaks. 4. Apply urethane adhesive to area of leak. 3. Spot weld burn through at gutter under rear window. 1. Inspect for spot weld burn through. 2. Apply clear sealer to any spot weld burn through. 4. Insufficient rear compartment lid weatherstrip compression. 1. Apply tracing powder to the rear compartment lid surface. 2. Close the rear compartment lid, but do not slam. 3. Open the rear compartment lid and inspect for voids of tracing powder on the weatherstrip. 4. Adjust weatherstrip by bending upward on weatherstrip flange where a void is indicated. 5. Pinched rear compartment lid weatherstrip. 1. Inspect rear compartment lid alignment. 2. Align rear compartment lid, if needed. Refer to section 10-8 of the service manual. 3. 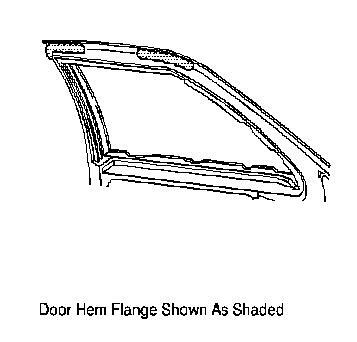 Adjust weatherstrip, if needed, by bending weatherstrip flange. 4. Replace rear compartment lid weatherstrip. 6. Void between rear compartment lid weatherstrip carrier and pinch weld. 1. Apply a solution of 50% soap and 50% water around the exterior of exterior of the weatherstrip carrier. 7. Loose or missing tail light nut. 1. Install tail light nut. 2. Tighten tail light nut. 1. Gasket void at rear compartment lock cylinder. 1. Direct water over rear compartment lock cylinder. 2. Inspect inside rear compartment for leaks. 3. Remove rear compartment lock cylinder. Refer to section 10-8 of the service manual. 4. 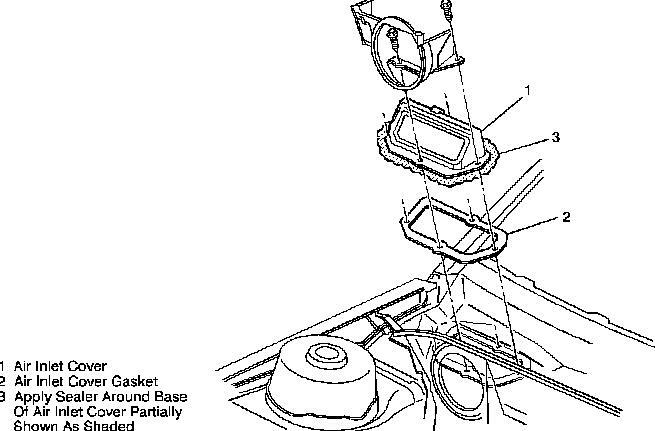 Sedan only - install new rear compartment lock gasket. 5. Coupe only - install rear compartment lock gasket. 6. Install rear compartment lock cylinder. Refer to section 10-8 of the service manual. General Motors Bulletins are intended for use by a professional technicians, not a "Do-It-Yourselfer". They are written to inform those technicians of conditions that MAY OCCUR on SOME vehicles, or to provide information that could assist in the proper service of a vehicle. Properly trained technicians have the equipment, tools safety instructions and know-how to do a job properly and safely. If a condition is described, do not assume that the bulletin applies to your vehicle, or that your vehicle will have that condition. See a General Motors dealer servicing your brand of GM vehicle for information on whether your vehicle may benefit from the information.